Your consignment will be collected and delivered in a way that has the least impact on the environment. Green Courier uses sophisticated vehicle tracking management software which accurately calculates the emissions of each individual vehicle per journey, optimising your delivery accordingly. 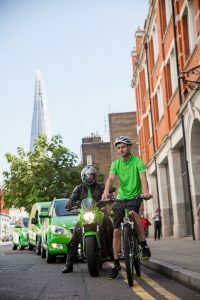 This same day courier delivery in UK is a service that offers the optimal balance between speed and environmental impact, where deadlines are adhered to without compromising our carbon emissions commitments. This courier service uses a dedicated vehicle and is given the highest priority. 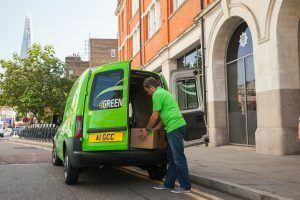 Within minutes of your booking, a Green Courier Despatch Agent will collect your consignment and transport directly to its destination. This same day delivery courier service in London is a premium service for super-urgent requirements, or for consignments that are large enough to completely fill the capacity of the vehicle being utilised. All consignments are picked-up and transported back to the company’s main distribution facility (via our ECO service) for safe storage. The goods are weighed, and then despatched at the relevant time to ensure that the deliveries are made within the predefined timing window. Some of these runs are pre-set on a daily/weekly/monthly basis, and others are simply booked ad-hoc when required. 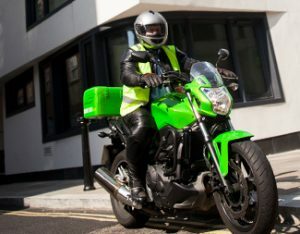 Where possible, the same courier will be utilised (especially for daily runs), as this helps to develop a relationship between the client and their regular delivery driver. For more information on pricing tariffs/rate cards, please contact your Green Courier Account Manager.